Did you know Twitter was actually invented in 1935? Pretty much! 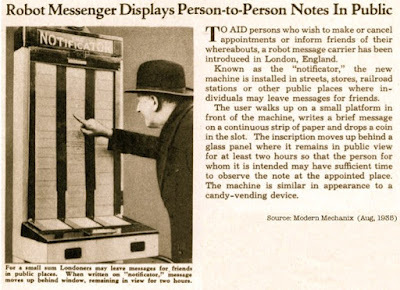 The Notificator was a machine you would drop a coin into, write a message on a continuous slip of paper and it would be displayed for 2 hours. A live message board! Of course you had to walk downtown to get your messages but still kewl!